This time, dear Travelpeeps, we have something very special for you. Nǐ hǎo from Hong Kong, the first stop of our Asia tour. Yes, what is so special about this article? The special thing about it is that it exists at all. Why is that? Well, there is hardly any really good written information about the Yick Fat building in Hong Kong to be found at all. But therefor even more Instagram shots instead. 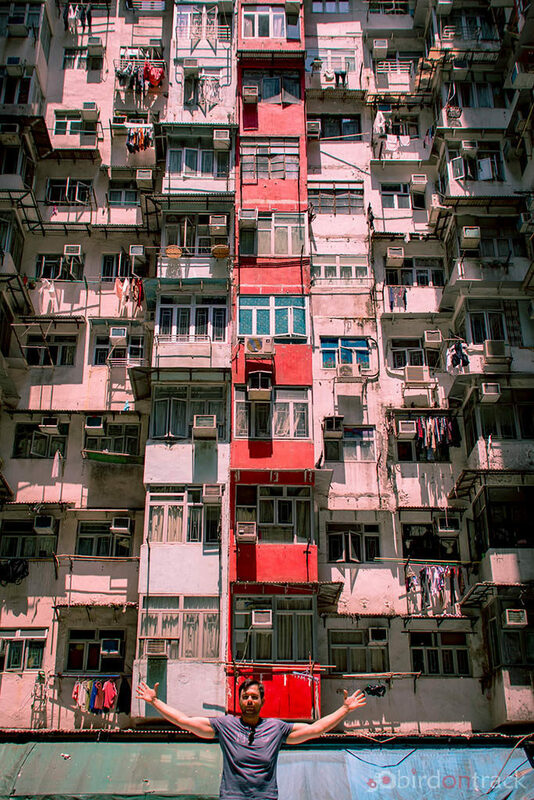 You guessed it, the Yick Fat is one of Hong Kong’s most popular photo opportunities and yes, there is a reason. Why? We will tell you that in the following article. Some of you might know the movie Bloodsport with Jean Claude van Damme. A legendary martial arts movie playing in Hong Kong. More specifically, in the then existing Kowloon Walled City. A city in the city, by far the most densely populated area in the world. Controlled by the Chinese Triads and mostly illegally inhabited. A place you did not really want to visit. Or maybe, but then with a scary-frightening feeling. 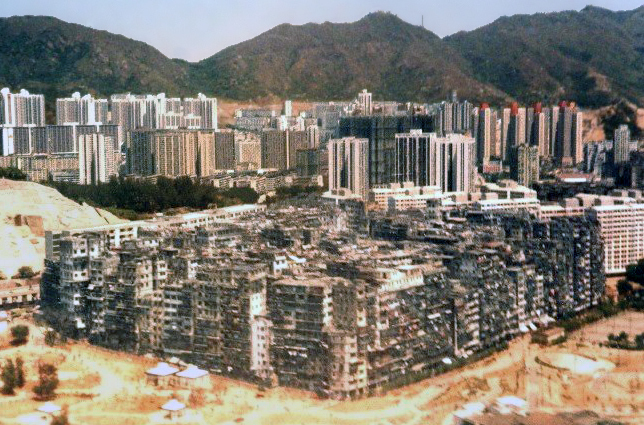 The Kowloon Walled City was then demolished piece by piece between 1993 and 1994 and the illegal inhabitants resettled. There, the Kowloon Walled City Park was built at that very spot. OK, and what does that have to do with the Yick Fat? 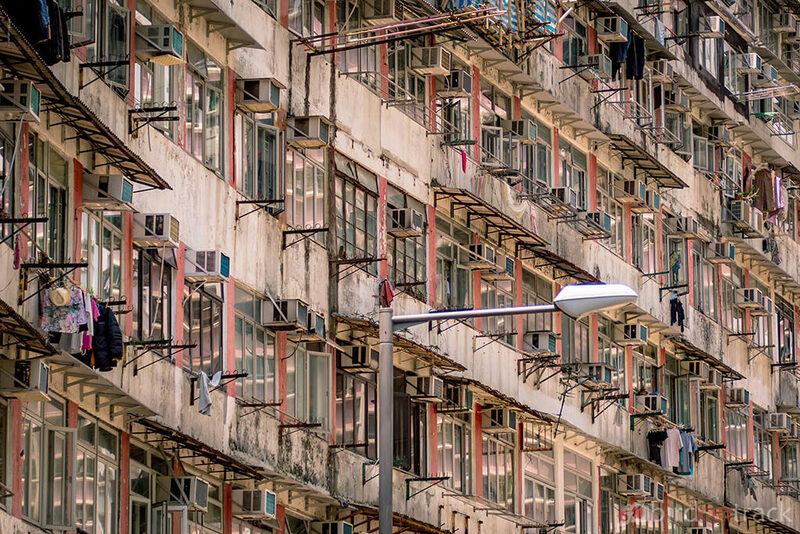 The Yick Fat comes as the only relic of this extremely densely populated living space (even for Hong Kong standards) of the Kowloon Walled City still the closest. 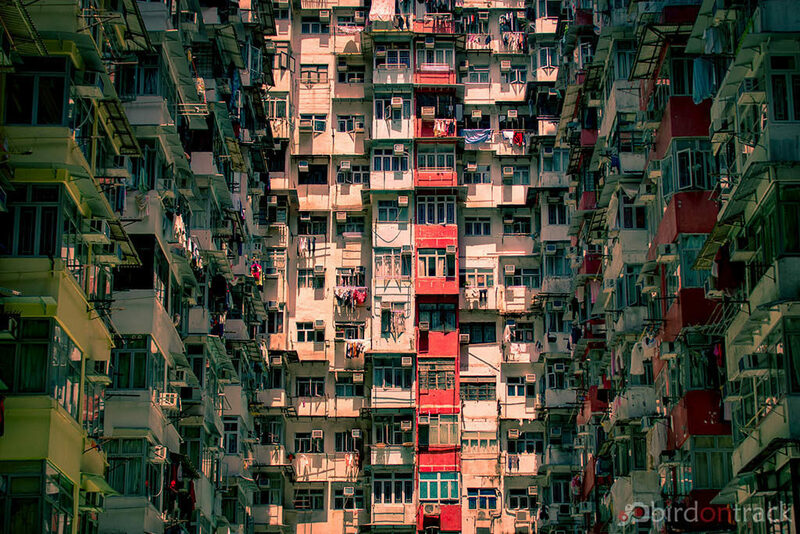 Even if, according to eyewitnesses, the Kowloon Walled City must have been completely incomparable. Yick Fat became famous in 2013, when Michael Bay chose Yick Fat as one of the film locations for his film “Transformers 4” in the same year. The building has received worldwide attention and has since become one of the most popular social media motifs, most notably on Instagram. Characteristic is its courtyard, from which almost all images are taken. What strikes you immediately when entering is this incredible intensity, this narrowness, almost oppressive. Three huge blocks of flats, which seem to have no end to the top, are forcing the viewer into a certain narrowness. Interesting, almost spectacular, however, is the open, fourth wall. This reveals the view of an even larger, quite modern looking skyscraper, which offers a beautiful contrast to the Yick Fat. An almost surreal spectacle that you have to admire for a few minutes. Some of the most spectacular shots of the Yick Fat are both the façade of the front building, through which you enter the courtyard. The combination of concentrated compactness and interesting color scheme is unparalleled. The sheer size of this facade also makes this motif monumental. Furthermore, as already mentioned, the open end of the apartment blocks with a view of the giant skyscraper offers exciting motifs. Here you can play wonderfully with perspective and angle. 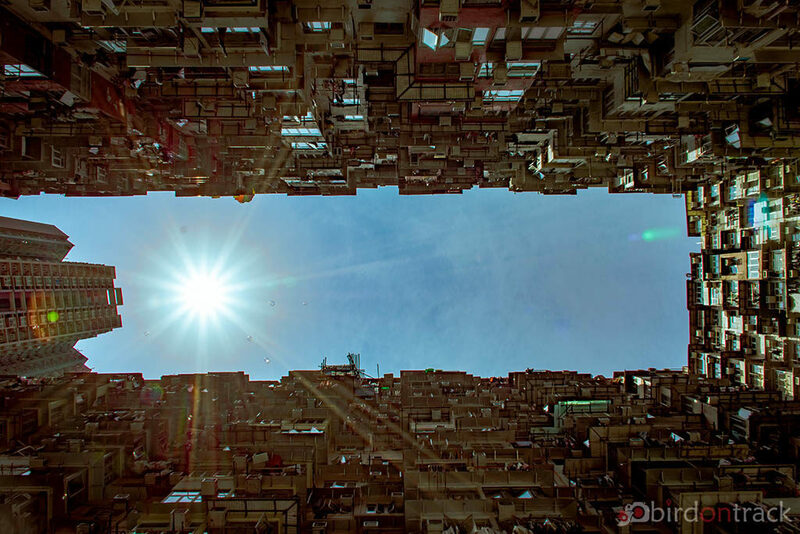 Last but not least, you make great shots by lying on the floor and taking pictures of the sky, framed by the Yick Fat residential complex. If then here, e.g. the sun is at a favorable level, very impressive shots succeed. Where do you find the building now? 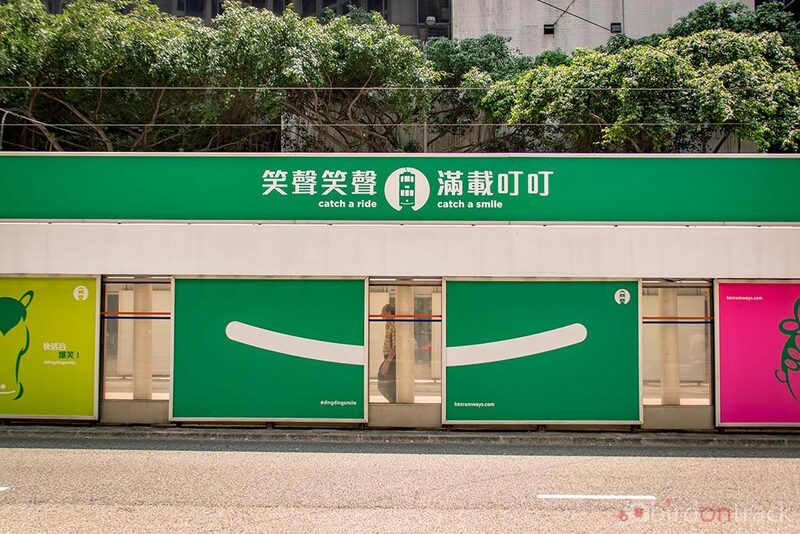 Take the Island Line to Tai Koo Station and walk to Exit B for Kings Road. Alternatively, you take an Uber and let you drive to the proverbial front door. Uber (recently replaced by Grab in many parts of Asia) offers the possibility to get to any place in Hong Kong at any time by private taxi. 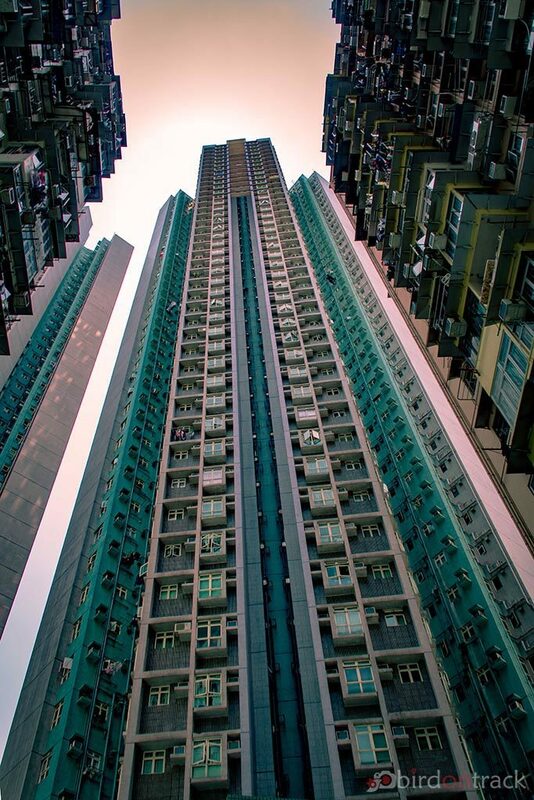 The building is located at 1048-1056 Kings Rd, Quarry Bay, Hong Kong. Sure, your visit to Hong Kong should not miss Yick Fat. Its central location and easy accessibility emphasize this. In addition, the entrance costs you nothing. 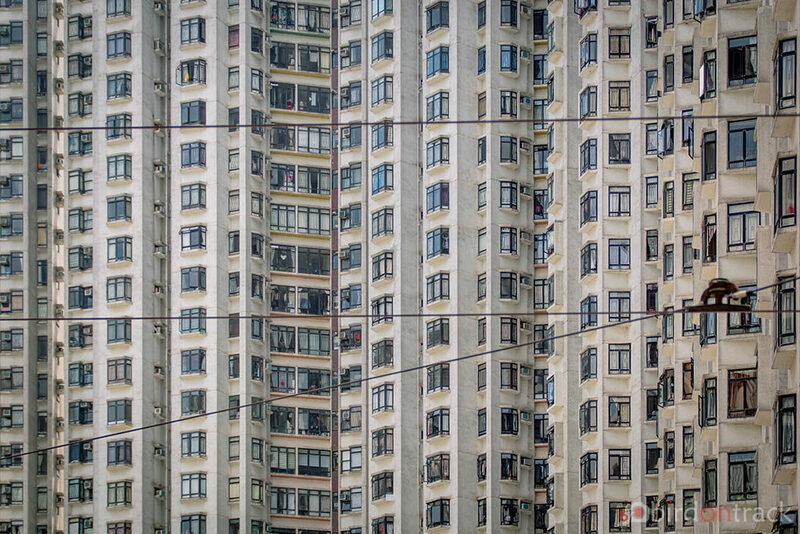 And last but not least, you get incredibly spectacular shots of one of Hong Kong’s most distinctive buildings. So no excuses, let’s go. That’s it from Quarry Bay, Hong Kong. See you again in the next article. Then from lofty heights, namely the so-called Victoria Peak, the legendary observation deck on Hong Kong. You can find all fetishes from the article as always in the gallery. The Yick Fat building is so unique, I can’t believe I missed it when I was in HK many years ago. It’s such an interesting design, with the walled look! I love all your photos, as per usual. Your tips on where to get the best photos is also very useful. This is indeed offbeat. Never heard of Yick Fat building. Hongkong in my mind is always that sparkly, impeccably clean and sorted first world city. Thanks for bringing this new avatar. I went to Hong Kong but never saw the Yick Fat. I had not even heard of it before reading your blog post. It looks intriguing. And perfectly Instagrammable. Thanks for sharing this. This building looks absolutely amazing. I will definitely visit when I go to HK. The design looks really interesting and your pictures make it look even more irresistible. 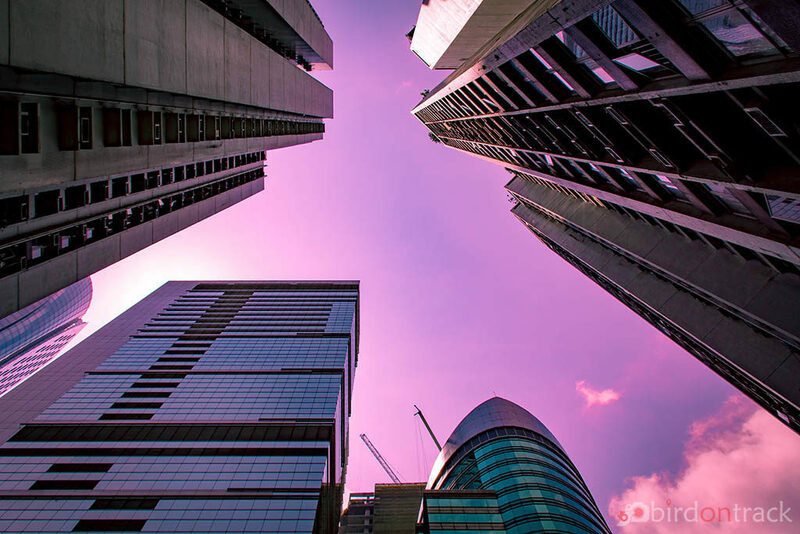 Gosh….the buildings indeed look claustrophobic. You are right! That old pic of the walled city looks spectacular and looks like nothing much has changed over the years, isn’t it? Maybe a new sky-scrapper has replaced the old one. I am glad you haven’t just mentioned this as one of the five things to see in Hongkong and just left it like that. Instead, you have taken the effort to inform us, your readers about the various aspects of the location. Thanks for the effort 🙂 And, yes..the captures are splendid !! The Yick Fat Building is indeed unique and so is its history. 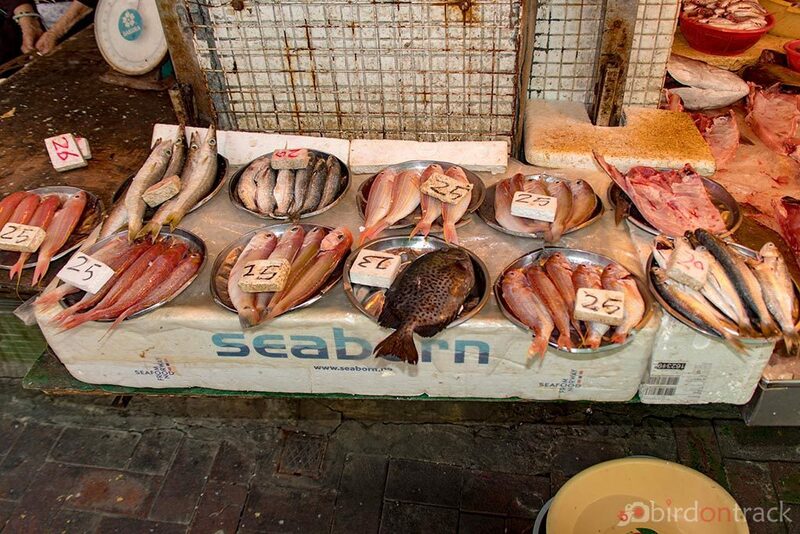 We were not aware of this incredible place when we were in Hong Kong a few years back. 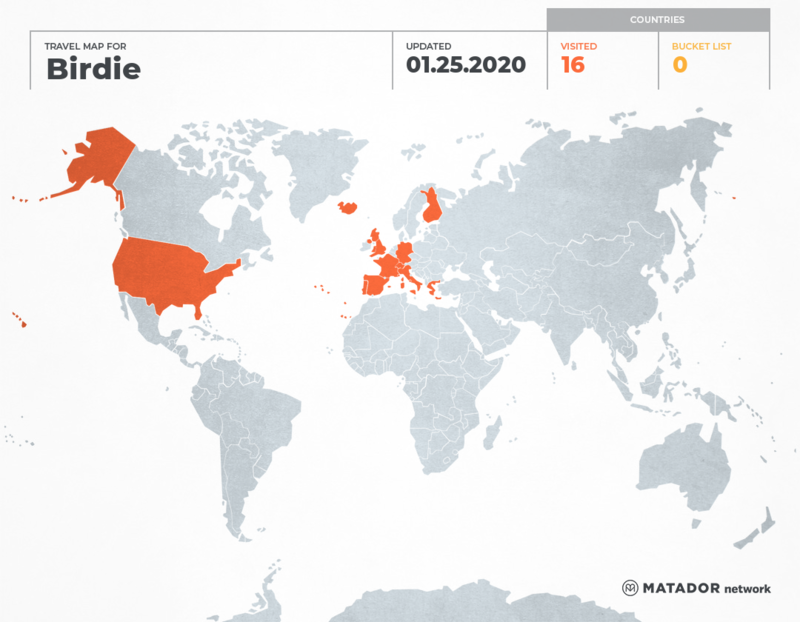 So this gives us one more reason to head back to Hong Kong one of these days. The place is indeed what seems like an instagrammers delight. 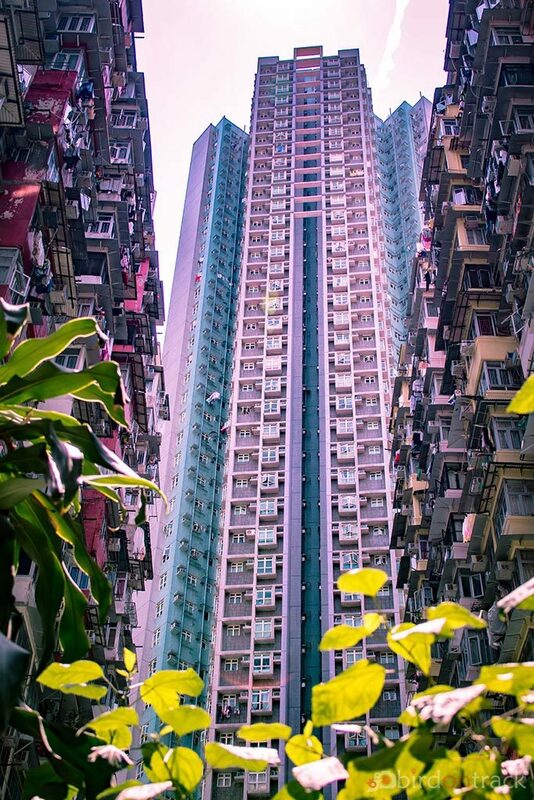 Had never heard about Yick Fat building but its so very interesting to learn about something like this in Hong Kong. The picture is intriguing for sure. There was no end, no starting, so claustrophobic. I would love to visit it for some cool Instagram pics.